Some of the local school districts began school today, and the local Salvation Army in Portsmouth, gave out a helping hand to some of those families who were unable to purchase clothing for their children to start school. They were able to host four families with school clothing assistance. 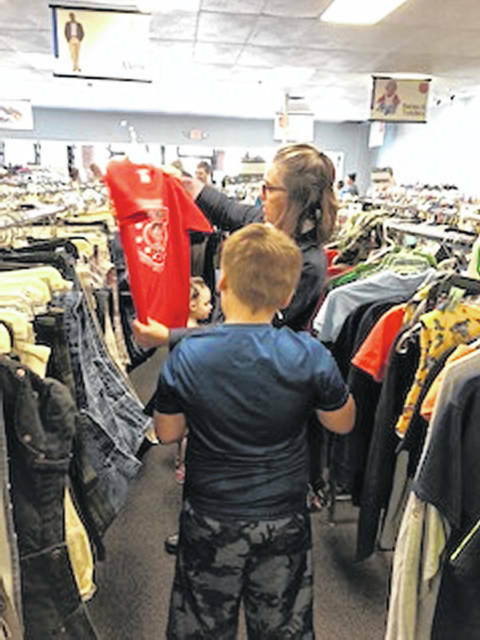 According to Emergency Assistance Provider for the Salvation Army Jane Jarrells, they had received a few calls about assistance for some clothing to start the school year. Jarrells said they would like to do something like this again next year. The captains are new to the area, they came in August to the area, she’s new to the programs. This is something she said they hope to continue and next year they want to have kind of a jump start on it. The mclothing event was August 14th. “We asked the families to come all at one time, so we could serve them better, because when you are dealing with vouchers at the Thrift store, it can get a little tedious, so we asked them all to come at the same time.” She said the store was not closed when they began their shopping, but by the time they were finished, they were closed and they were able to finish with them better. Jarrells said they had volunteers that helped the families and the captain’s daughter was home at the time and she was able to help them as well. Jarrells also wanted to mention that they were thankful too for those who donate to the Salvation Army to even make these things possible. The old saying, someone’s so called trash, can be a treasure for someone else, is so true here, because the community donates, instead of throwing things away, several children can go to school with ‘new’ clothing, just like everyone else.